Most of our guests come visit McGregor Mountain Lodge to get out and explore Rocky Mountain National Park. And for good reason. The natural beauty is breathtaking and "The Park" offers hiking options that are second to none. But there are no dogs allowed! So how can you get out with your four legged friend and where can you go to enjoy this magnificent corner of the Rockies?! Well, we have some perfect options for you! On the south side of Estes Park there is a local's secret that, for some reason, hasn't made it onto the typical tourists radar. Maybe it's because it's hard to find any good info on except by word of mouth. We're here to help! The trail doesn't offer spectacular vistas, or lead you to any top secret destinations. It's a simple trail. One that invites you into a nice walk. Or begs you to appreciate the smaller things such as the infant waters of upper fish creek. Or a song bird encouraging more steps along the trail. It's a mix of dirt road and single track trail. You'll meet locals and their dogs and enjoy views of Twin Sisters Mountain. The end of the trail spits you out at the Baldpate Inn and Lily Lake. A delightful trail that you'll make a staple for you and your pup when you visit. Red Tape: None. Just know that when you reach Lily Lake you are now on National Park Property and dogs are not allowed on trails. 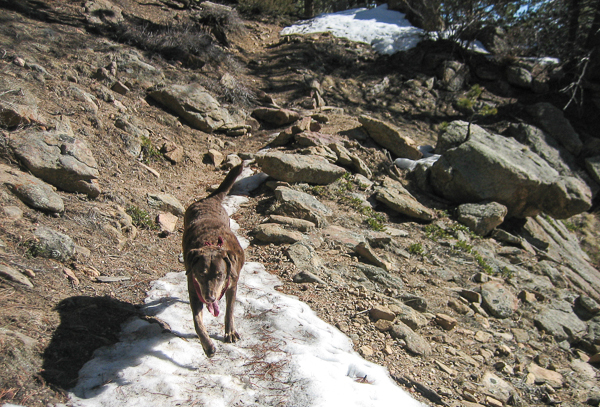 Daisy enjoying the Lily Mountain Trail on a warm March day! This easy to moderate trail is located just south of Estes Park on HWY 7. It's a short but somewhat steep trail that offers wonderful views and is a fantastic option with your pooch. 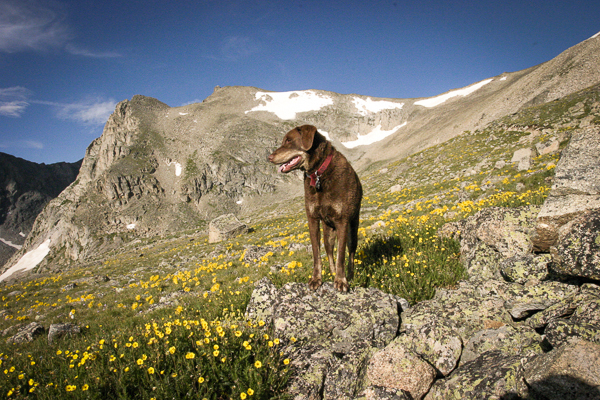 This is a must-hike every year for many who bring their four legged friends to Estes. The trail can fool you though as it starts off uphill, then it descends a bit before turning uphill steeply and winding through the forest to the summit. 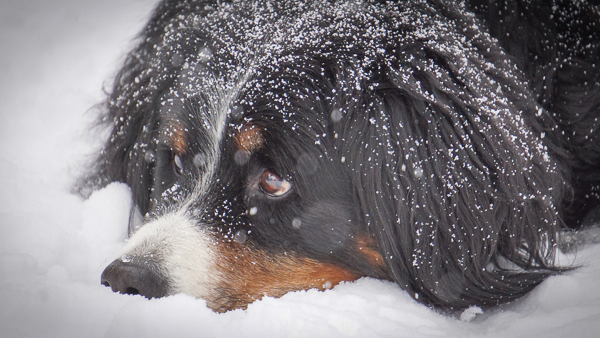 The summit block is quite slabby and blocky, so it may pose issues for smaller dogs. 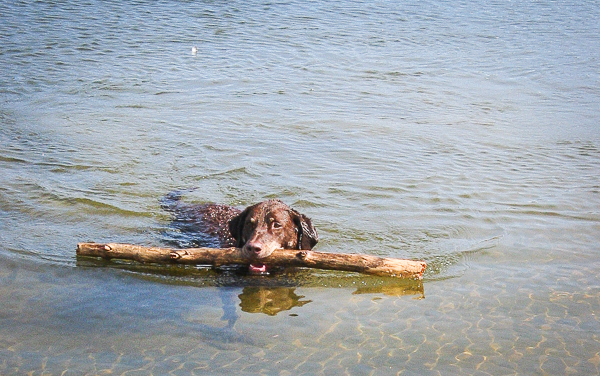 Enjoying a swim in Lake Estes after a warm hike! Pole Hill Road is a 4x4 road that can get you all the way to Loveland. It's rugged and a favorite spot for some serious off road enthusiasts. But it's also a perfect spot for a hike or run with your dog! There are many options on this road with several roads intertwining and intersecting up there. Bring a map and pay attention. It's not that you could really get lost, but, if you're not too familiar with the area, you could get turned around a bit. Don't let that scare you off though! It's beautiful up there! The views are great and in the autumn there are some perfect aspen groves! If you can find your way, go check out the fire tower on the summit of Panorama Peak! Red Tape: None. The trail is always open to hikers even if it is "closed." It is usually designated as closed from Dec. 1st until the snow melts. Be aware of adjacent private land. In the heart of the Indian Peaks Wilderness lies Pawnee Peak just above and to the north of Pawnee Pass. This is a spectacular summit in an equally spectacular setting. The summit is reached via a 4.55 mile (9.1 mile, roundtrip) trail that gains roughly 2,500 feet, topping out at 12,943 feet. But if you don't want to make the trek all the way to the summit, you can turn back at many of the worthy destinations along the way, such as Long Lake, Lake Isabell, and Pawnee Pass. This trail begins at the Brainard Lake Recreation Area. Red Tape: $10.00 per vehicle entrance fee per day. You simply pay at the entrance. Easy and obvious. Another wonderful summit, and probably one of the most popular in Indian Peaks Wilderness, is Mt. Audubon. While the trail is shorter, only 7.9 miles round trip, it is certainly steeper. It gains 2,800 feet in that shorter distance. So get your uphill legs ready! The views are spectacular and well worth the effort, so don't let the fact that it's a tougher trail scare you off. The summit reaches 13,233 feet and also begins at the Brainard Lake Recreation Area, but at the Mt. Audubon Trailhead. Tanner likes to get out in any weather!